China's first Mars probe is expected to be launched in October this year in a joint operation with Russia to study the causes of Mars once abundant water, after a two-year delay, the People's Daily reported Sunday. 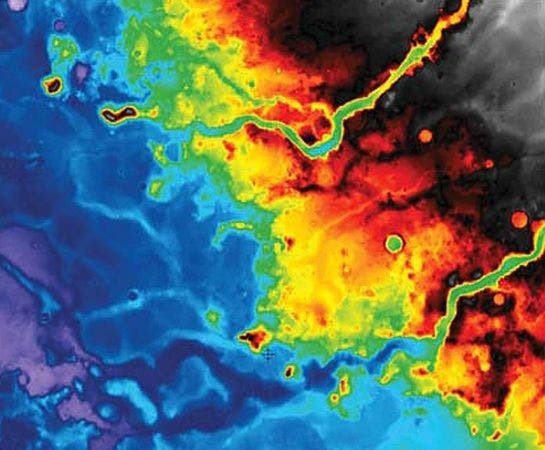 The image above is from a suite of Mars orbiters that combined forces to create a new geologic map of Mars that adds to evidence the red planet once hosted expansive lakes. The probe, Yinghuo-1, was due to blast off in October 2009 with Russia's "Phobos Explorer" from the Baikonur Cosmodrome in Kazakhstan but the launch was postponed, the official Xinhua news agency said. The report said the blast-off had been pushed back to October this year, and added that China planned to launch a solo Mars probe in 2013. According to previous reports, the orbiter is due to probe the Martian space environment with a special focus on what happened to the water that appears to have once been abundant on the planet's surface. Satellite images suggest that Mars was warm enough to sustain lakes three billion years ago, a period that was previously thought to be too cold and arid to sustain water on the surface. The research, by a team from Imperial College London and University College London (UCL), suggested that during the Hesperian Epoch, approximately 3 billion years ago, Mars had lakes made of melted ice, each around 20km wide, along parts of the equator. In the new study, the researchers analysed detailed images from NASA's Mars Reconnaissance Orbiter, which is currently circling the red planet, and concluded that there were later episodes where Mars experienced warm and wet periods. 3D virtual reality video of Ares Vallis, which is a giant gorge that runs 2000 km across the equator of Mars. The lakes and their interconnecting channels can be seen a third of the way through the video. The researchers say that there may have been increased volcanic activity, meteorite impacts or shifts in Mars' orbit during this period to warm Mars' atmosphere enough to melt the ice. This would have created gases that thickened the atmosphere for a temporary period, trapping more sunlight and making it warm enough for liquid water to be sustained. The researchers used the images from the Mars Reconnaissance Orbiter to analyse several flat-floored depressions located above Ares Vallis, which is a giant gorge that runs 2,000 km across the equator of Mars. Scientists have previously been unable to explain how these depressions formed, but believed that the depressions may have been created by a process known as sublimation, where ice changes directly from its solid state into a gas without becoming liquid water. The loss of ice would have created cavities between the soil particles, which would have caused the ground to collapse into a depression. The scientists were able to lend further weight to their conclusions by comparing the Mars images to images of thermokarst landscapes that are found on Earth today, in places such as Siberia and Alaska. Thermokarst landscapes are areas where permafrost is melting, creating lakes that are interconnected by the same type of drainage channels found on Mars. "We can now model the 3D shape of Mars' surface down to sub-metre resolution, at least as good as any commercial satellite orbiting the Earth. This allows us to test our hypotheses in a much more rigorous manner than ever before." The next step will see the team extend their survey to other areas along the equator of Mars so that they can ascertain how widespread these lakes were during the Hesperian Epoch. The team will focus their surveys on a region at the mouth of Ares Vallis called Chryse Planitia, where preliminary surveys of satellite images have suggested that this area may have also supported lakes. China has already begun probing the moon and the Mars probe will be the next step in its ambitious space exploration program, which it aims to be on a par with those of the United States and Russia. Image credit: USGS -Using data from the Viking, Mars Odyssey, and Mars Global Surveyor orbiters, scientists created a false-color picture of rocks and minerals in the Hellas Planitia region in Mars's southern hemisphere. The map reveals sedimentary deposits that match what would be found as material gets washed downhill into standing bodies of water. These deposits date back to between 4.5 and 3.5 billion years ago, to a period when scientists think Mars could have hosted liquid water.